However, depending on the kind of group you joined, you may be faced with the responsibility of creating and hosting educational and/or social events on your own. For some, this is an exciting prospect. For others, not so much…especially if simply joining the group in the first place took you out of your comfort zone. 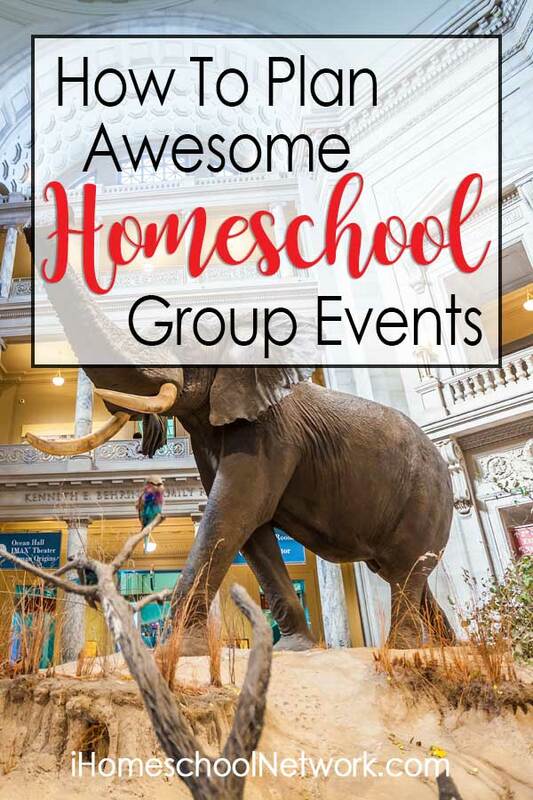 Whether you’re a seasoned enthusiast or have never planned homeschool group events before, here are some tips, tricks, and ideas to help you make them exciting and engaging! 1. Learn your group’s rules and event guidelines before you begin your planning process. Are parents required to volunteer and if so, what are the volunteering guidelines? Do they require a certain number of events or volunteer hours? Are there event-specific requirements like dates or times? Do you have to coordinate your event within a larger schedule or curriculum that your group follows? Every homeschool group or co-op is different so it’s important to make sure you clearly understand what is expected of you before you begin. 2. Decide what sort of event you want to plan. This can be as simple as leading a group science experiment or art activity, like this Fall Leaf Art & Science Project. Or it can be more complex, like creating a multi-class unit study series based around a book or other theme. But don’t skip reading this step if you feel daunted by the prospect of teaching a class! This next part is especially for you!! If you have a talent, hobby, skill, or interest, don’t discount your ability to teach others about it!! You don’t have to have a formal, written curriculum to guide you, although you certainly can. You really needn’t look any further than your own experiences. Are you good at sewing? Teach a basic sewing skills (or more advanced how-to) class. Do you like cooking or baking? Walk through a recipe or help the kids learn about the meal planning and creating process by planning a group feast or fiesta. Let the kids help with each step from recipe selection to grocery shopping to cooking and serving! If you enjoy gardening, create a gardening workshop. If you have the space, create a group garden that the class takes care of for a season. Is reading your favorite pastime? Start a book club. You could read books out loud to littles or have bigger kids choose books to read and present. To give even more depth to this idea, try adding in art or science projects or even field trips related to the book you’re reading. Are you a woodworker? Glassblower? Artist? Scientist? Technophile? Board game enthusiast? Animal lover? Writer? Bird watcher? Pilot? Mechanic? Yogi? Great! You have so much to offer!!! Need a quick class idea? Check out a book or two about chameleons. Read them to the kids and then do this simple but fun craft together! Some locations will have a specific section for homeschoolers but if they don’t, check under their events or school field trip sections. Even if they don’t mention homeschoolers specifically, call and ask what is available for your group. You might be surprised at what you discover! Note: Make sure you get as specific as you can with the arrangements. You need to be clear on what the facility requires not only for attendance and age-level, but also with entrance or participation fees, space availability, etc. Homeschool groups often come with lots of adults and siblings in tow so you need to know what is and is not allowed or included. If at all possible, try to establish a primary point of contact at the facility or attraction to make it easier for you to make all the arrangements. The natural world around us is full of learning opportunities. Observing plant and animal life in its native habitat can be fascinating all on its own. To supplement your walk, you can always create a nature scavenger hunt or bingo game. You can encourage the kids to record their observations in a nature journal, take pictures, or even collect artifacts like leaves, rocks, and sticks (when it’s allowed and appropriate). They will likely have lots of questions that will lead to further learning! There are so many other things you can plan for your group! Plan a scavenger or treasure hunt. Have a tea party complete with cucumber sandwiches and biscuits. Throw a costume party. For added fun, plan a historical figure meet and greet where the kids dress up as their favorite historical figure and present facts about their figure to the group. If you’re planning an event for older kids, have them mingle in character and try to figure out who everyone is! 3. Create your event following your group’s guidelines or procedures. Event-specific details such as items that need to be brought (e.g., sunscreen, art supplies, etc.) or whether or not there is an age-restriction or attendance cap. Any other special considerations parents need to know such as allergen information, dress code, etc. As a courtesy, it’s always a good idea to send out reminders prior to any RSVP deadlines and then again to attendees the day before the event. 4. Prepare as many of your event supplies in advance as possible. This is especially helpful if you’re hosting a class that requires a lot of supplies or prep work, such as an art or science class. Pre-cut out any templates or other paper pieces. Make sure you have plenty of worksheet copies, instruction sheets, utensils, or other supplies. If you’re putting together a project during the class, make a mock-up or sample beforehand so you know how it will work. This will help you avoid any unexpected surprises and give you time to fix any issues. As much as this may front-load the amount of preparation work you have to do, it’s worth it! There’s nothing worse than trying to keep a class full of elementary kids engaged and entertained while you’re cutting out a template or preparing some other element. 5. Finally, don’t be afraid to ask for help! If you’re worried about planning an event on your own, ask another parent to assist you, especially one who has planned events for the group before. It’s okay to also ask for help if you realize that you’ve bitten off more than you can chew…even if it’s well into the project! Just make sure you’re specific about what you need. Trying to handle it all on your own will make it unnecessarily stressful and will take all the fun out for you (and probably your kids too)! Homeschool group events can be so rewarding for both you and your children. You will be surprised at what you will learn and how much fun it can be! Have you planned homeschool group events before? What have you done? Do you have any tips or ideas to share? I’d love to hear them in the comments below! My name is Kristi and I am the wife of a wonderful husband and mother to two energetic boys, aged 7 and almost 2. I blog at Savvy Schooling where I share lots of resources and encouragement for your homeschooling and parenting life. I love bird watching, journaling, reading, yoga, and all things Star Trek.